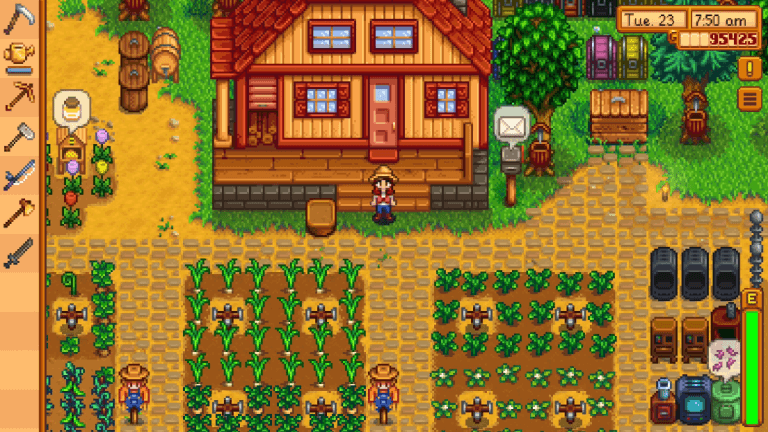 Stardew Valley fans have been enjoying harvesting crops, tending to farm animals, dug greedily and deeply in the mines, gone fishing, maybe even managed to move in with their SO, for a while now. On a multitude of platforms too, although none of them were mobile (as in, phones), which is a darn shame. Fortunately that’s about to change, iOS port right around the corner and Android… well, it’s taking a bit, but they should have it ready soon. Groovy stuff. Now, while the porting won’t be handled ‘in-house’, The Secret Police taking care of both Android and iOS, according to the blog post, it won’t be a watered-down version. Not at all, the game playing identically to its desktop/console counterparts, save for minor UI changes to work properly with touch controls. That’s it. Oh, and no multiplayer. So two things. At least save data – minus mods – can be transferred from the PC version to iOS via. iTunes, which is a very nice touch (get it?). I for one am certainly looking forward to taking my farming adventures on the road – how about you? iOS? Android? Or ya much too busy playing Stardew Valley on one of the readily available non-mobile platforms? Let your voice be heard in the comments… below all this! Stardew Valley is on Steam, GOG.com and Humble, carrying a $14.99 price tag. Will be on iOS come October 24, with Android soon after, hopefully, carrying a $7.99 price tag and no IAP.